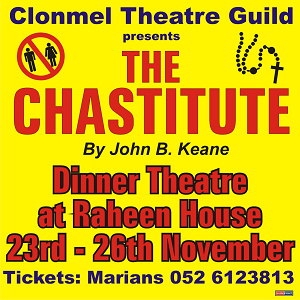 This is a John B. Keane play and in it he has captured rural Ireland with all their prejudices and morals in an hilarious and insightful way. There is a wonderful and experienced cast; indeed Ger Meagher shines as The Chastitute in a part that could have been written for him. Among the large cast is Amanda Kirwan who is known for her comedy and Sean Bergin who brings his wonderful experience from groups as renowned as Brewery Lane, Carrick, and Stagemad in Waterford. The cast also includes Edmond Ryan (artistic director), Ann Loh, Ricky Dunne, Michael Hennessey, Catherine McVicker, Carol Acheson, Sandra Hickey, Jessica Keane, Anita Hickey, John Leahy, Jim Malone, Tom Callery and Liam Lankstead. It is wonderful to have so many people on stage and that there is so much wonderful talent in Clonmel.